On August 18, the California Senate unanimously approved Concurrent Resolution (ACR) No. 155 to encourage statewide policies to reduce children’s exposure to adverse childhood experiences. As reported on ACEs Too High, the resolution is modeled after a Wisconsin resolution that encourages state policy decision-making to consider the impact of early childhood adversity on the long-term health and well being of its citizens. Since the resolution does not require California Gov. Jerry Brown’s signature, the Senate’s approval is the final step in the process. New programs or mandates are not included in the resolutions, but both provide an important framework for state level decision-making that is informed by the findings of the CDC’s Adverse Childhood Experiences (ACE) Study. The two state resolutions are natural extensions of already robust ACEs-related and trauma-informed programs and policies in those states. The principal sponsor of the California resolution was Assembly Member Raul Bocanegra (D-Pacoima) who spoke on behalf of the resolution on the Assembly floor and was joined by Rob Bonta (D-Oakland) and Reginald B. Jones-Sawyer, Sr. (D-Los Angeles). Bonta said that “sadly and tragically” almost every youth in the City of Oakland has been touched by violence and that life expectancy is negatively impacted by conditions in vulnerable communities. Jones-Sawyer said that conditions that result in urban PTSD are “unnoticed and unaddressed.” To see these short speeches, click here http://calchannel.granicus.com…d=7&clip_id=2332 and scroll down to ACR 155. The video also shows the adding of 68 members as coauthors. The early years of a child’s life are critical for proper development. Yet, far too many of California’s children grow up in harsh environments – exposed to violence, abuse, and poverty. It is not surprising that these experiences impact their health and development in severe and long-lasting ways. Adverse childhood experiences are traumatic experiences that occur during childhood – such as abuse, neglect, and household dysfunction. Adverse childhood experiences can result in toxic stress – the strong, frequent, or prolonged activation of the stress response – disrupting the development of a child’s brain architecture and other organ systems. The outcome is a lifetime of health consequences, compounded with inflated costs to the state’s juvenile justice, criminal justice, health care, and public health systems. A person with four or more adverse childhood experiences is 10 times more likely to use injection drugs, 7 times more likely to be an alcoholic; 2.5 times more likely to have a stroke, and twice as likely to have cancer. Astoundingly, the life expectancy of a person with six or more adverse childhood experiences is 20 years shorter than a person with zero adverse childhood experiences. And sadly, the impacts disproportionately affect our most vulnerable communities of children who are too often exposed to trauma. ACR 155 emphasizes that it is more effective and less costly to positively influence the healthy development of a child’s brain than to attempt to correct poor learning, health, and behaviors later on. 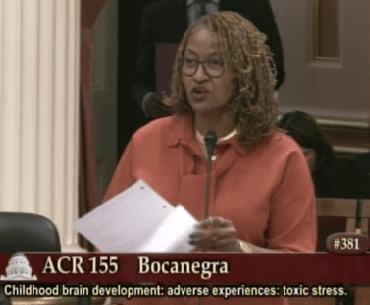 ACR 155 further urges the Governor to reduce children’s exposure to adverse childhood experiences, address the impacts of those experiences, and invest in preventive health care and mental health and wellness interventions. This resolution has enjoyed bipartisan support with 68 Assemblymembers listed as coauthors on the measure. I respectfully ask for your ‘AYE’ vote. The Wisconsin and California resolutions add to the growing state momentum behind ACEs and trauma-focused policies and programs. On August 13, Massachusetts gave final approval of a bill to create conditions for “safe and supportive schools” intended to improve education outcomes for children statewide; this gave momentum to the state’s trauma-informed schools movement. Earlier this year, Vermont passed a limited but meaningful provision in a larger health bill to evaluate whether ACE-informed medical practice should be included in the state’s health plans. The first ACEs law passed in 2011 in Washington State (House Bill 1965), establishing a statewide framework for reducing ACEs and making funding and governance changes related to child and family services.